It doesn’t take too long browsing Kickstarter and Indiegogo to begin noticing a pattern. Instead of taking an educated guess, we decided to gather data from over 2,094 tech projects that started in 2016 from across various crowdfunding sites to see how different tech startups use language. What we found was that tech crowdfunders love to describe themselves as “The World’s First Smart” whatever. 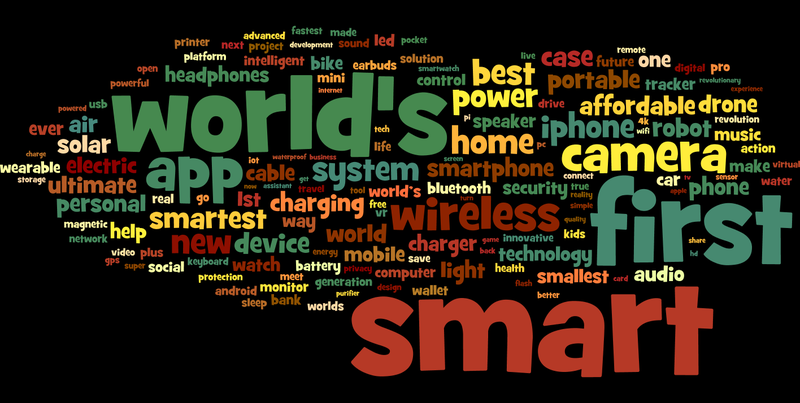 Our word cloud analysis shows that the words, “world’s,” “first,” and “smart” are used most often by a wide margin. That trend continues in the descriptions of tech crowdfunding campaigns, which feature the use of the same three words over and over again. 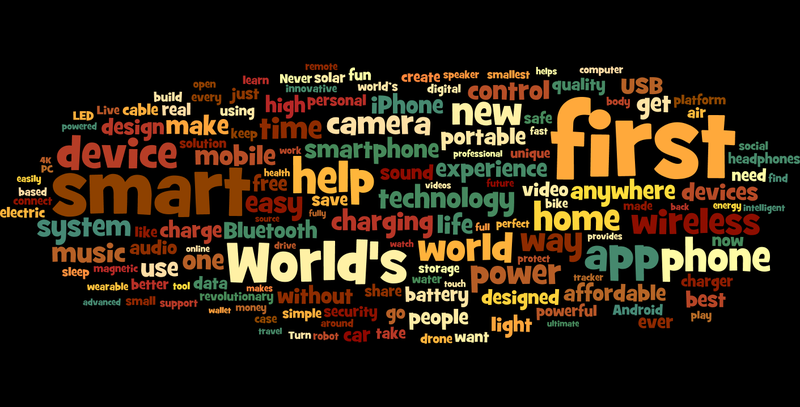 However, tech startups use fewer hyperbolic words in their descriptions with words like “device” and “help” topping the most used words. Interestingly, there’s a lot of language in tech crowdfunding descriptions that try to explain how a product actually helps a consumer in their every day lives. This is great, as a product has to have clear value and be unique to other offerings on the market. With the death of the headphone jack, spurred by the iPhone 7, there are many words regarding mobile wireless technologies. Technologies like Bluetooth, wireless charging, and battery life all make frequent appearances across tech campaigns. This means tech startups are treating the death of the headphone jack as opportunity. Just make sure you can actually deliver your fancy wireless headphones on time, especially if you bash Apple for its delays. While it’s tempting to use the words “world’s,” “first,” and “smart” in your campaign title, it can be fatiguing for the user who has likely seen dozens of the same products claiming the same thing. Instead, tech startups should look deeper at their product to identify the true reason why people should be excited about it. Can’t think of why your product is unique? It’s probably time to go back to the drawing board before you launch your campaign.